An art considered magical in ancient India for its incorporation of all five elements of nature, terracotta was one of the earliest forms of creative expressions and craftsmanship. It lives on today as a representation of ethnic Indian beauty creating a niche for itself. 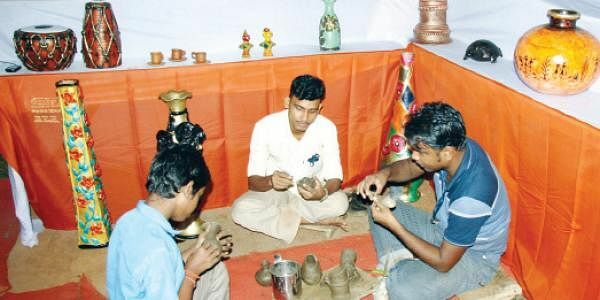 Over 70 terracotta artists from 20 districts of the State have come together on a common platform to display their works on a shared theme of ‘Maati’ at Mruttika, the annual expo of terracotta, being hosted by the Department of Handicrafts, Government of Odisha, at the Exhibition Ground. Artisans from Keonjhar, Jajpur, Sambalpur, Barpalli, Subarnapur, Balangir, Rayagada, Khurda and Nabarangpur among other districts, have gathered here. The exhibition is highlighting the fact that the terracotta tradition across the State has been very strong. In fact, Odisha is one of the few states where it is being used on a daily basis for storing, cooling, cooking, planting, tableware and ornamentation. “Terracotta finds its roots in different ancient civilisations when it was used for cooking, building, ornamentation, recreation, currency and trade in different ways. The methods of making and firing are similar even now, creating an enduring bond from the ancient to the current clan of potters. And that is the bond the government aspires to strengthen with this effort,” said Jagannath Mohanty, Additional Director, Department of Handicrafts. Each of the 44 kiosks set up here has terracotta crafts unique in its own way. The kiosks of Bhadrak displayed terracotta replicas of Rajasthan’s musical bands as well as beautiful showpieces and earthen ovens made of baked-clay. Artists in some of the kiosks are also demonstrating preparation of the clay figurines. Earthen ware utensils and colourful crockery set adorning intricate motifs exhibited at other kiosks also attracted visitors. The fair is replete with figures of mythological and tribal deities in different sizes. Miniatures of different animals, vases, pots and baked clay, wind chimes are also available at reasonable prices. There are simple yet fascinating lamps and lanterns at the fair. The expo, open for public from 2 pm to 9 pm daily and from 12 am to 9 pm on Sundays, will conclude on October 15.